PLEASANT VIEW — Years of focus, dedication and effort have paid off once again for Cory Pincock — he recently qualified to represent the United States in an endurance motorcycling race held Nov. 1 through Nov. 6 in Morelia, Mexico. Pincock, a married father of three boys, lives in Pleasant View and co-owns Comfort Solutions, an HVAC company based in Ogden. He and 33 other riders emerged from more than 900 hopefuls across to country to make up the American team competing in the International Six Days Enduro, the oldest off-road motorcycle event associated with the International Motorcycling Federation. About 530 riders representing 35 countries will converge on Morelia for the event, along with tens of thousands of spectators. Pincock said the ISDE is quite demanding, requiring participants to ride eight hours a day for six straight days. The object isn’t to simply be the fastest; riders are assigned an individual minute of the day to begin their ride and must arrive at the designated checkpoints within specific time windows. The goal at each point is to “zero your check,” avoiding penalty minutes that follow each rider throughout the competition. Eight special speed tests each day are peppered throughout the course. To prepare, Pincock has increased his riding to several hours in each training session. He also lifts weights and maintains a healthy diet. He plans to use a rental bike, as endurance riding is notoriously hard on motorcycles. Kara Pincock, Cory’s wife of 13 years, often serves as his pit crew. A friend and fellow rider, Mike Knight, also will help in Mexico. “We’ll be there with his food, water, spare parts and tools. Only the riders can work on the bikes, though, and must complete any required repairs in only 15 minutes a day. If we even touch the gas cap, he’ll be penalized,” Kara said. The bikes are under lock and key each night. Riders are also monitored carefully. Helmet transponders, helicopters and special course marshals help maintain the integrity of the race. Endurance racing is relatively new to Pincock, 34, who began riding motorcycles at 8 years old. At 12, he decided to switch from dirt bikes to trials biking. Studying the sport by watching a video, Pincock taught himself the skills required to master the motorcycle discipline that requires riders to avoid penalty points by keeping their feet off the ground while maneuvering the specially designed bikes over and around objects. 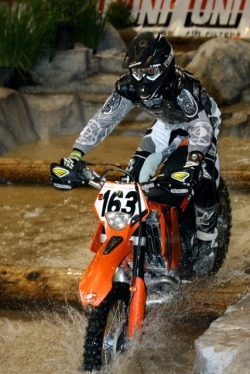 He tired of trials riding and switched back to dirt biking several years ago. Pincock’s success in both trials and endurance riding is unique. The five disciplines recognized by the FIM are motocross, road, track, trial and endurance. “Most guys don’t switch disciplines like Cory has. He’s one of just a few who’ve done it successfully,” Kara said. The couple has continued the motorcycle tradition with their sons, Quinn, 12, Dylan, 10, and Trevor, 5. Each member of the Pincock family owns a motorcycle, and the family takes regular trips to ride and race all over the West. Kara said the boys love to ride and have raced successfully, just like their dad. “The main thing I love is that it really is a family sport,” she said. Pincock’s hard work and dedication has helped him achieve several titles. At 15, he earned the title of 1990 High School National Champion in trials biking. In 1994, he qualified to compete in the prestigious Trials de Nations in Florida, the only time it was held in the U.S. He and the three other members of Team USA came in ninth. In 2000, Pincock qualified again to compete in the Trials de Nations, held that year in Spain. His team won the gold medal. He also earned a place on the pro class Top 10 lists for the North American National Championship Trials Series in 1999 and 2000. Among the many exciting aspects of the competition itself, Pincock enjoys the patriotic feel associated with the opening and closing ceremonies. “Wearing the team uniform and carrying our flag during the Presentation of Colors is an honor. It’s an awesome feeling,” he said. The newest helmet will join the others displayed in the family’s living room, representing his time on U.S. biking teams. Pincock believes he won’t win the ISDE because many of the competitors are more-experienced, full-time racers, but said the opportunity to ride in the world’s longest-running annual motorcycle race is its own reward. “It’s not very often that you get to be a part of something like this. It’s pretty cool,” he said. For more information, to follow the race and check Pincock’s progress, consult the race website at www.isde2010.com . Represented Team USA on the Junior team in 1992 competing in New York. Creator of FAST Racing (Fathers and Sons Team Racing team, devoted to providing a positive environment for Fathers & Sons to enjoy the sport of off-road motorcycle riding and racing together). Cory was able to ride consistently both days on a very difficult course to receive a Gold medal both days and qualify for the ISDE in Mexico this year!